This appetizer says spring to me , its light & fresh! OMG I'm ready for spring!!!! Bring it on! Combine and finely chop first 4 ingredients. Roll cheese log evenly in herb mixture; wrap in plastic wrap. Chill at least 2 hours or up to 24 hours. Preheat oven to 350°. Drizzle baguette slices with olive oil. Gently press slices into 24 muffin cups in muffin pans. Bake at 350° for 7 to 9 minutes or until crisp and lightly browned. Remove from oven; let cool in pans 5 minutes. 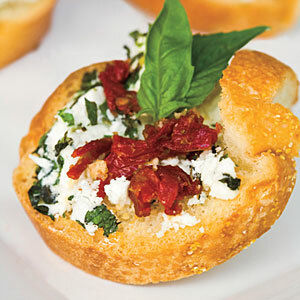 Spread goat cheese into baguette cups; top with sun-dried tomatoes and basil leaves.